This all natural herbal paste formula is tremendous and we will prove it! Receive a FREE parasite exam with the purchase of each 6 (six) tubes. Can be used on any horse, any age. If you normally rotate, consider using Worm Check with rotation! 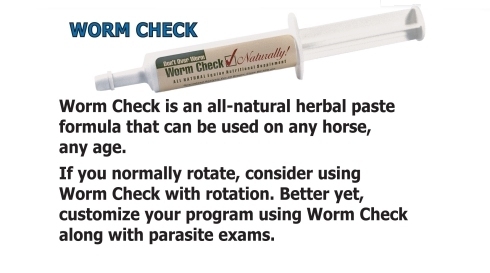 Better yetâ€”customize your program using Worm Check along with parasite exams. Consider using our RED CAL to compliment your regimen. Diatomaceous Earth, Garlic, Artemisia, Clove, Psyllium, Glycerin, Apple Flavor. For any horse of any age. Each paste syringe will treat 1200 lbs. 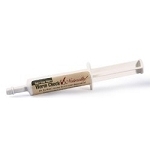 "Worm Check is not a chemical dewormer. It actually works by supporting the horse's own immune system.Â It is really not parasite specific- We have found it effective on all common species except bots and tapes, which are impossible to truly test for"